Find White House themed gifts, memorabilia clothing, toys, desk accessories and hats. The White House Director pen set is beautifully designed in cherry-wood that includes two pens: one you twist to expose the ball point and one with a removable cap, both pens are inscribed with �The White House, Washington, DC� and have a likeness of the White House etched onto their barrels. Start your recent graduate off on the right foot with this patriotic white Great Seal of the United States towel. Around the official Seal are the words, "UNITED STATES OF AMERICA - WASHINGTON DC". White House Executive Pen Set: White House Executive Pen Set is perfect and decent gift for Dad. Both pens say "The White House, Washington DC" and have a likeness of the White House etched into the barrels. 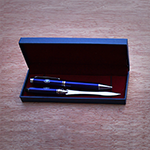 White House Executive pen desk set consists of two cherry-wood ballpoint pens in a cherry wood combination gift box. It has beautiful display stand. Dad will love this item !!!! 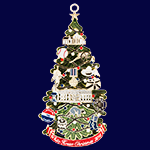 Set of 1981 to 1984 Ornaments: 1981 Angel in Flight, 1982 George Washington (1789-1797), 1983 John Adams (1797-1801), 1984 Thomas Jefferson (1801-1809). This Holiday Ornament captures Americas pioneer spirit within its decorative frame and Aquia centerpiece. Its twin Aquia sides, mined from Aquia sandstone quarries on Government Island, depict the north and south faces of the White House. George W. Bush became our 43rd president following one of the closest elections in American history. Only the second man to follow in the presidential footsteps of his father, Bush developed a political philosophy known as "compassionate conservatism" that encouraged limited government, individual responsibility, and strong family values.